Spoilers (probably) for Northern Lights, The Subtle Knife and maybe some for this book too.So, this was the final installment of Pullman's His Dark Materials trilogy and after really enjoying the first two, I was pretty excited for this. I was a little disappointed.However, the good things come first. Lyra and Will continue to be really interesting protagonists, with their strengths and weaknesses nicely balanced; meaning that they are not always strictly great people and it really does make them feel more human. It was also kind of nice to see Roger, Lyra's friend from Oxford who dies at the end of Northern Lights when Lord Asriel uses the energy gained from separating him from his daemon to create a window between the worlds. To see a character who believes so wholeheartedly in Lyra was nice, especially as Lyra herself was already having some self-doubts by that part of The Amber Spyglass.The new characters and creatures introduced in this novel were also rather fascinating. The two angels that are sent to guard Will; Balthomas & Baruch are pretty cool, especially the former; Pullman's angels are not the literal types that we generally imagine, rather they are almost ghost-like beings. I also really liked the Gallivespians; tiny spies who fly on dragonflys or hawks and who have venom in their spurs that they can use to attack fully-sized people and the mulefa; a strange non-veterbrae, gazelle/elephant type being who actually use wheels to travel about.The plot generally kept rolling on, but for me lacked the pace of The Subtle Knife, and lacked the expected epic war that kept being hinted at throughout the trilogy; the ending was a bit of an anti-climax to me. It also hinged on the idea that a 12-year-old girl and a boy of roughly the same age could fall deeply, deeply in love, in a kind of 'soulmates' style and thus save the world from ruin. Whilst I could handle mild crushes, the idea that two-essentially children-could be described as desperately kissing each others hot faces I'll admit I felt slightly uncomfortable. To me, Pullman's desire to re-enact Adam and Eve, and the Fall, is all well and good; but perhaps he should have selected protagonists that were slightly older; but then this would have messed with his whole Dust idea.I especially disliked how the characters of Mrs Coulter and Lord Asriel suddenly changed either at the beginning of or midway through this novel. The reader has seen Mrs Coulter desperately grasping power within the church, developing a machine that would separate children from their daemons and casually snapping a witch's fingers in order to extract information from them. Then all of a sudden, we get Mrs Coulter being all maternal and desperate for Lyra to survive when the church decides that the way to save themselves is to kill her. This came from just about nowhere. Whilst Coulter saved Lyra from Svalbard, the reader didn't see any form of care from her. I actually really enjoyed Mrs Coulter as a villain, and when that was removed from her she seemed a little bit...meh. Lord Asriel was similar. Whilst he began Northern Lights as some glamorous, mysterious explorer; he ended it as a man who would go to any length to bring about what he wanted. 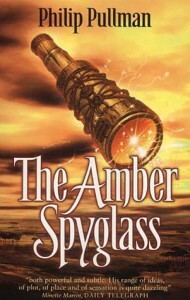 For the most part of The Amber Spyglass he is pretty anti-Lyra; his only interest is in getting Will and his knife on his side; but then suddenly he is in awe of his daughter and is ready to sacrifice himself in order to bring about her happiness.I'm gutted about the ending of this series, because I really enjoyed the first two. I am still in awe of Pullman's attention to detail and his creation of numerous worlds is brilliant; and I find the idea of a daemon really clever. I do recommend this trilogy, because it's brave and vast in scope; it just didn't quite live up to my expectations in the end.